Major update has been released. Look below the interview! We sat down with YandereDev, who is the sole creator of Yandere Simulator. We’ve talked about Yandere Simulator before and wanted to sate our curiosity (and hopefully, the curiosity of our readers). Q1: First off, thank you for taking time to answer some questions for us! Our readership and followers of your work are very interested in hearing more about Yandere Simulator. Could you start by giving a short summary of yourself, your previous work as a game developer, and the origin of Yandere Simulator? It’s always a pleasure to talk about the game, so thanks for granting me an interview! My name is Alex. In my early twenties, I realized that my passion for gaming ran so deep that I’d never be happy unless I was working in the game industry. I got a job as an intern at a game company, and gained a ton of experience in the field; I worked on console games, handheld games, and mobile phone games. Over the course of three years, I slowly took on more responsibilities and tried out many different roles until I found my true calling – programming. Eventually, I developed the skills necessary to become a freelance programmer / indie developer, and left that company to pursue my lifelong dream of creating games of my own design. I spent a few months working on various game prototypes and pitching numerous game ideas on Internet forums. Most of my game ideas and prototypes didn’t generate any interest at all, but one of them stood out and got a really strong positive reception — Yandere Simulator. I was tired of working on game prototypes that nobody was interested in, so it was delightful to find an idea people were actually enthusiastic about. I decided to throw myself into Yandere Simulator completely, and never looked back. Q2: Out of curiosity, what was it that made you want to create Yandere Simulator as a 3D sandbox-like game, rather than something with a tighter narrative (but ultimately, easier to create) such as a text-based game, 2D game, or even a story-driven (less sandbox-y) 3D game? When I first asked people what kind of mechanics they would want to see in a game that simulates the experience of being a Yandere girl, most people suggested features that were best suited for a sandbox game. 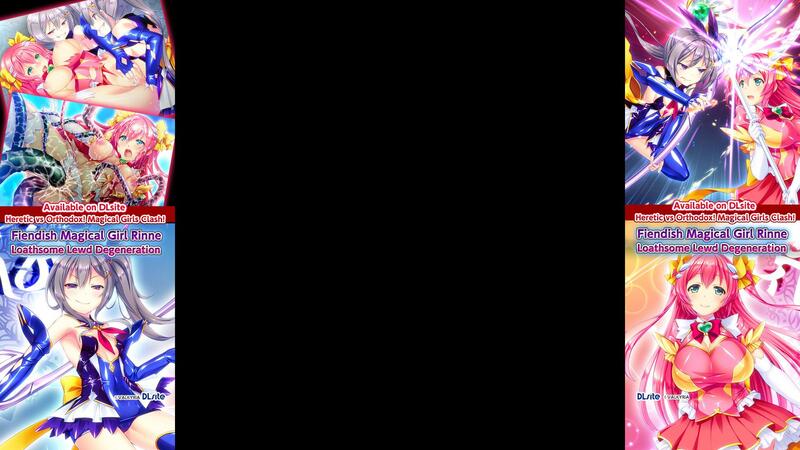 A 3D game can also provide the player with visual spectacles and gameplay options that just aren’t as satisfying when limited to text or 2D graphics. Although I love 2D games and story-driven games, I want to provide a sandbox experience that 2D games and text-based games just can’t deliver. Q3: While murder isn’t always the best answer, it seems to be the simpliest. Will there be benefits for a “pacifist” run of the game? I would like for Yandere Sim to feel like a game where there is no “proper” way to play; just a bunch of options and choices that are all equally valid and fun. I don’t want to punish the player for choosing to play the game a specific way, but there have to be some realistic consequences for certain risky behavior. Using violence would bloody your clothing and damage your sanity. Being caught in an incriminating situation would damage your reputation, and being caught in the act of murder could get you arrested. Playing the game in a pacifistic manner would allow the player to avoid all of those risks. It might turn out that the pacifist method is actually the easiest and least challenging way to play the game! However, I hope that players will try out all of the different methods for eliminating their rivals, from violence to social sabotage to “playing Cupid” with the rivals. Q4: Readers of LewdGamer will be familiar with the term “yandere,” but what is it about your (our?) specific Yandere-chan that you like the most? I would like to avoid having a protagonist with a strong personality or sense of identity, because the character could be polarizing for players who don’t relate to her. Instead, I would like for “Yandere-chan” to be more of a blank slate; an indifferent, apathetic, empty girl. Her emotionless nature will explain how she is unable to feel empathy for others, or feel guilty about committing murder. She is meant to be a vessel for the player, rather than be a deep character. The player’s actions will most likely determine what kind of personality she demonstrates at the end of the game; depending on what kind of actions the player takes, she could turn out to be a murderous psychopath, a cunning manipulator, or a sweet and innocent girly girl. Due to extremely popular demand, the protagonist will also be customizable. Although I favor the idea of a protagonist with a recognizable and memorable trademark appearance, most fans of the game have requested the ability to dress her up in whatever clothing, accessories, hairstyles, and colors they desire. The result is that there won’t really be one specific official Yandere-chan; instead, everyone will get to have their own personal Yandere-chan. Q5: The incinerator is an interesting touch for disposing evidence, and a katana is of course superior folded steel and all that. Western players have been wondering what an incinerator or a sword are doing at a school and calling them unrealistic—care to enlighten them here? In Japanese high schools, it’s customary for students to clean up their own school at the end of the day; it’s part of learning personal responsibility and respect for one’s own environment. It’s not uncommon for a Japanese high school to have an incinerator on school grounds for the purpose of disposing of trash at the end of the day. It’s something I’ve seen in a few anime, so it strikes me as something that has to be present in the game for authenticity. Q6: Are there any plans to flesh out the police investigation after being caught? Right now it says that being caught is a Game Over state; might there be a kind of questioning system, or the ability to give alibies? The ability to bully other girls into submission has been mentioned—maybe they would lie for you too? Are we trying too hard to shoehorn more features in our head? I’m a little worried that adding a police interrogation minigame would break up the pacing of the game. I would prefer for the gameplay to be smooth and unbroken; end the day, see the results, move on to the next day, repeat. A police interrogation might be logical and realistic, but if it would interrupts the normal flow of gameplay or feel like an annoying chore that is preventing the player from resuming normal gameplay, I’d prefer to leave it out. With that said, the game design is always subject to change based on feedback, so if players say that the game needs another “phase” or “stage” that occurs under specific circumstances, I’d definitely consider police interrogations. I haven’t considered the idea of bullying girls until they fear Yandere-chan enough to lie to the police. On the contrary, if Yandere-chan has a negative reputation at school, students might be more willing to come forth with information that implicates her in a crime. “Yes officer, I did see someone suspicious today. Yandere-chan was walking around with blood on her clothing!” On the other hand, if Yandere-chan has a positive reputation acquired through good behavior, then students and policemen alike would be less likely to suspect her of a crime. Q7: Some of our questions have been very specific, touching upon specific features of the game: tell us, what is your favorite feature of Yandere Simulator (implemented or non-implemented)? I’m looking forward to the day when I have a locker room environment and bathing animations, so that I can implement the ability to sneak into the girls’ locker room and steal a girl’s uniform while she is bathing. According to a Japanese high school teacher that I’ve spoken to, the girl’s only course of action at that point would be to spend the rest of the day in her gym uniform. Situations like that are going to be very fun to implement! Q8: You’ve mentioned before that you’d like to crowd-fund the game; when can our readers and your fans expect to see a Kickstarter or other crowd-funding source set up? There was a point in time when I predicted that the game’s official demo would be out by March, and that the Kickstarter would be ready by April. Right now it’s March, and the official demo feels like its months away, so I’ve demonstrated that I can’t be trusted to make accurate predictions. With that said, I would like to estimate that the game might be ready for a Kickstarter sometime in the second half of this year (2015). Q9: Where can people find you and follow your work on the game, other than your Patreon, shamelessly plugged right into this interview question? Twice a month, I update the Yandere Game Development Blog, sporadically post YouTube videos and tweet news about the game as @YandereDev. Q10: Thanks again for your time on this interview and work on Yandere Simulator! Do you have anything to say directly to the readers? Yandere Sim is built almost entirely out of suggestions and requests that people made, so I’m always happy to hear from anyone who wants to share their ideas for how to improve the game. I’d also be very happy if the readers would download the sandbox test build and comment on the blog if they find any bizarre bugs! But most of all, I really hope that the final game meets everyone’s expectations! March 01, 2015 saw a major patch released for Yandere Simulator. This patch focused on adding new features, the most important of which is NPCs reacting to murders (which can lead to a game over). If an NPC witnesses you killing someone — or finds you at the scene of the crime — they will try to call the police; if they succeed, this is represented by a timer and a checklist of objectives to achieve to avoid getting thrown in jail. This NPC reaction is only one of a planned five reaction types to be implemented in later builds. 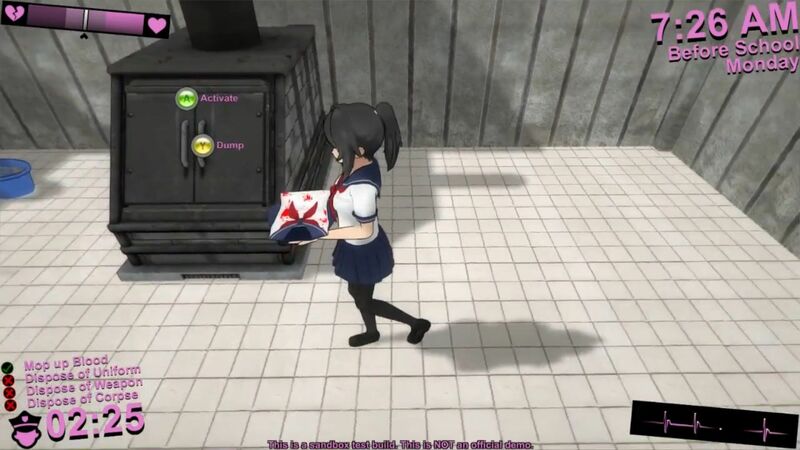 To avoid getting caught, the player can clean the scene of the crime using a mop (which deteriorates with use, getting more stained with blood until it is cleaned) and use the school’s incinerator to remove evidence (like bloody uniforms and weapons). If Yandere-chan fails and is found guilty by the police, this results in a Game Over. There are currently no plans for implementing any system that involves escaping the police once caught. Smaller features and bug fixes are also present: a katana has been added as a useable weapon, Yandere-chan can be customized more than previous versions, NPCs can be customized, etc… see the full patch notes and bug fixes over at The Yandere Game Development Blog, where a new sandbox build can be found for your yandere-specific pleasures.